Reliance Partners, LLC was ranked number 21 of the country’s Best Small and Medium Workplaces recently announced by consulting firm Great Place to Work® and Fortune. Great Place to Work® reviewed the survey results of more than 52,000 employees from hundreds of companies in the ranking process. Among the findings from the study: trust fuels business performance. For example, the Best Small and Medium Workplaces enjoy roughly three times the revenue growth of their peers, even as they provide a better experience for their people. 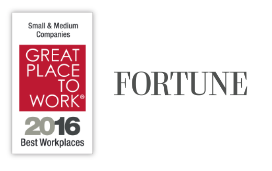 To learn more about the rankings, follow this link: http://fortune.com/best-small-workplaces/2015/.